We continue to review Wine of Moldova and we’re still on the white wine theme, but this time it’s the noblest of all whites – the royal chardonnay. 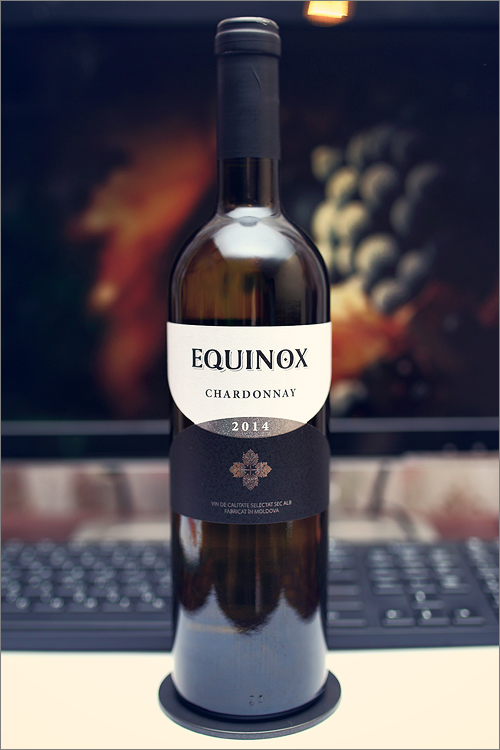 Even though it is hard to choose one from the vast array of chardonnay wine available on the market these days, this one was an easy pick, because we could not stand the waiting anymore – Chardonnay 2014 from Equinox. This is a full-bodied, oak-aged chardonnay wine, quite rare to find and not the most popular wine style among the wine enthusiasts these days. The wine has a pure topaz-yellow color, with a translucent oily-yellow rim-color. The nose is rich and amazingly sweet, with no signs of wine faults. The first nose is quite smooth and it brings notes of sweet fruits and honey: white pear, ripe quince, white apple, yellow mirabelle, candied pineapple, banana, almonds, white mulberry, honey, dry sweet melon and a hint of sweet oak-wood, which only confirms the fact that the wine was barrel maturated. The wine is medium-dry, with some subtle hints of residual sugar. It has moderate alcohol level, high acidity and medium tannin, that makes it taste oily, round and smooth. This is a complex and rich wine, that evolves with every next sip. It has a fair overall balance, with a lean and honeyed accent towards the end. The wine has a medium finish and a balanced aftertaste, crisp with a hint of bitterness towards the end. This is definitely a fine Wine of Moldova and the overall rating says the same, with 89.3 points scored it is right there, among the best wines we’ve tasted so far. Please click on the chart icon on the left in order to get to the wine rating page, where you can find all the wines we’ve tasted to date. Last but not least, we would like to mention that we’ve been quite impressed by this wine – on one side, it’s a classic, barrel fermented chardonnay and, at the same time, it has quite a nuanced, jammy-honeyed accent, that is more characteristic for a late harvest chardonnay wine. Nonetheless, this wine will make a perfect match for any white sauce based dishes, but the best match will be a healthy Fettuccine Alfredo plate. Yummy.